​When Miguel Almiron joined the newly-formed Atlanta United in 2016 following a spectacular season in Argentina with Primera Division champions Lanus, many in South America were left astonished by his decision to leave for Major League Soccer. After decades of teams selling their hottest prospects to clubs in Europe's top five leagues, a move involving one of the continent's most prodigious young talents to a newly-formed American outfit represented an almighty shift from the norm. Signed for a fee of £6.75m, Almiron adapted to his new surroundings immediately, scoring a total of nine goals whilst also providing eight assists as Atlanta progressed to the MLS Cup Playoffs in their inaugural season. Although the Five Stripes would eventually be defeated by Columbus Crew in the knockout stages of the competition, former ​Barcelona manager Gerard Martino had created the foundations needed to challenge for the title in 2018. Alongside Almiron and striker Josef Martinez, the signing of talented teenager Ezequiel Barco from Independiente allowed the Georgia-based club to field a fearsome attacking trio which set the league alight last year, contributing significantly towards a remarkable total of 70 goals in the Eastern Conference before helping their side advance to the MLS Cup final in December. In front of 73,019 supporters at the Mercedes-Benz Stadium, Atlanta completed their meteoric rise to the top of the American game by defeating Portland Timbers 2-0 as goals from Martinez and Franco Escobar sealed a historic triumph. 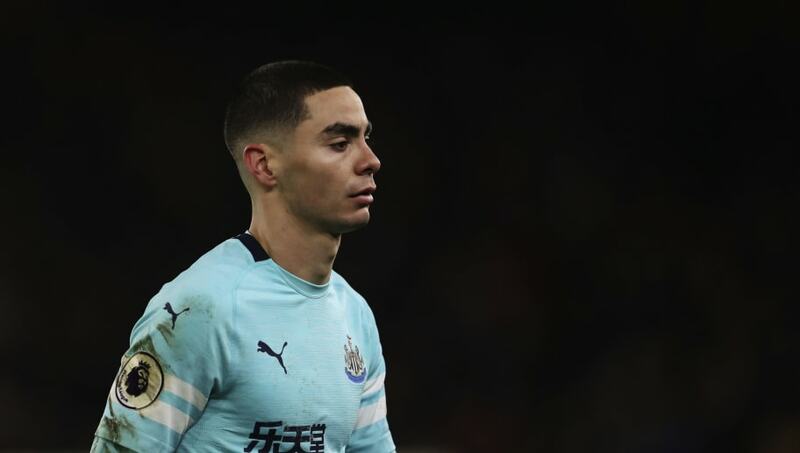 Following a superb 2018 campaign that saw him be directly involved in 25 goals for the Five Stripes, Almiron attracted the interest of ​Newcastle United, who had been monitoring the progress of his career for over a year before finally making their move in the January transfer window. By agreeing a £21m deal for the Paraguayan playmaker, the Magpies not only broke their own transfer-record but also set a new benchmark for the highest fee ever paid for an MLS player, surpassing ​Bayern Munich's £9m signing of Alphonso Davies from the Vancouver Whitecaps. The 25-year-old made his debut in a twenty-minute cameo appearance against Wolverhampton Wanderers, demonstrating an impressive turn of pace as well as an unerring level of confidence when in control of the ball during his side's ​1-1 draw at Molineux on Monday. Newcastle, who are currently 16th in the Premier League and facing a battle for survival with Burnley, Cardiff City and ​Southampton, will unquestionably look to Almiron to provide the creativity needed to avoid yet another relegation to the Championship. In what is expected to be a crucial first few months for the Paraguayan, the speed in which he can adapt to the hustle and bustle of England's top flight may define his career at St. James' Park. Yet despite the typical pressures that come with being a club's record signing, Almiron will undoubtedly benefit from the presence of manager Rafael Benitez, who has previous experience of nurturing the likes of Xabi Alonso and Fernando Torres after their arrivals from Spain whilst in charge of ​Liverpool. The Magpies' vociferous fans will also provide a level of support for the former Lanus star that is rarely seen elsewhere in Europe. A one-club city, Newcastle upon Tyne's devotion to all-things football has seen former players such as Alan Shearer and Jackie Milburn championed for their commitment to representing the Magpies. Giving the current state of affairs at St. James' Park, if Almiron can replicate even a fraction of the success that he produced for Atlanta United when representing Benitez's side, he will become the latest in a long line of heroes that have donned the famous black and white shirt. The success of both Almiron at Newcastle and Davies at Bayern could help to alter the shape of MLS forever. If both players thrive in their new surroundings, it may finally change the age-old opinions associated with America's top-flight division which first surfaced in 2007 following the creation of the Designated Player Rule, a law which allows teams to sign three players outside of their usual salary cap. For years managers opted to bring in seasoned professionals such as Thierry Henry, David Villa and David Beckham over younger stars who were at the beginning of their careers which somewhat hampered the development of the MLS as a respected league amongst supporters in Europe. However, Atlanta's signing of Almiron three years ago seemingly provided the spark that was needed for change in America, as now clubs are beginning to bring in talented prospects from South America to bolster their squads. The Five Stripes' sale of their main playmaker to Newcastle in January was addressed by new manager Frank de Boer, who replaced the Paraguayan by completing the headline-grabbing signing of Gonzalo 'Pity' Martinez from River Plate for $17m. An Argentina international, the 25-year-old ​scored the winning goal in the Copa Libertadores final for Los Millonarios against arch-rivals Boca Juniors and is considered to be yet another major coup for the MLS, following in the footsteps of Almiron and Barco who both made the move from the Primera Division. Although the MLS is thriving in terms of attendances with an average of 21,875 spectators per match in 2018 compared to just 13,756 in 2000, the fact that clubs can only bring in three designated players could very well be limiting the league's progress. A move to either scrap the rule completely or to extend it to include a higher number of players could benefit America's top-flight division, which has undoubtedly improved in terms of the quality over the past two seasons. If the MLS' hierarchy do decide to tweak this specific law, they could open their doors to the prospect of revolutionising their league as players from around the world could decide to join clubs across the United States, therefore increasing the competitiveness on show.